Robotics action is back at Canby High School as two teams, the MechaniCougs and the CougarBots, are off to a strong start as part of First Tech Challenge. The students have been working on the building and programming of their robots since the start of their season in September. Each year a different game is revealed by the FIRST organization. This year's game is called Rover Ruckus, which sends robot alliances into space to land from a landing module, claim a depot, harvest gold and silver from craters, and latch back onto the landing module. The robot can score points during two scoring periods – autonomous and driver-controlled. The alliance with the most points wins and the whole game lasts two-and-a-half minutes, so there is a lot of fast-paced action. The MechaniCougs are Riley Esmay, Cameron Hadd, Tanner Hovanic, Drew Wright, Hoang (Tommy) Phan and Cole Kuehl. The Cougarbots consist of Gabe Browning, Alex Sunderland, Thomas Wing, Lucas Nissly, Joshua Bussey, Kaleb Blaschke and Ethan Porter. The teams meet after school several days each week to strategize, design, build, program and test their solutions to the game challenges. Following guidance from adult coaches and mentors, the students develop science, technology, engineering, and math skills, while learning to value hard work, innovation, and sharing ideas. On Jan. 26, the teams competed in a qualifying tournament with 19 other teams in the Midwestern and Capital leagues in Junction City. Both Canby teams did extremely well and advanced to the next level. The CougarBots finished in eighth place overall and won the first place Connect Award, which recognizes the team for helping the community understand FTC and exploring opportunities available in the world of engineering, science and technology. The MechaniCougs were part of the winning alliance at the tournament and ranked No. 2 overall. The team won several awards -- 3rd place for the Inspire Award, 3rd place for the Think Award, and 2nd place for the Motivate Award. Both teams will be competing in the super qualifier tournament on Feb. 9 in Hillsboro to determine which teams will advance to the state tournament. At the super qualifier, the teams will compete in at least five matches. 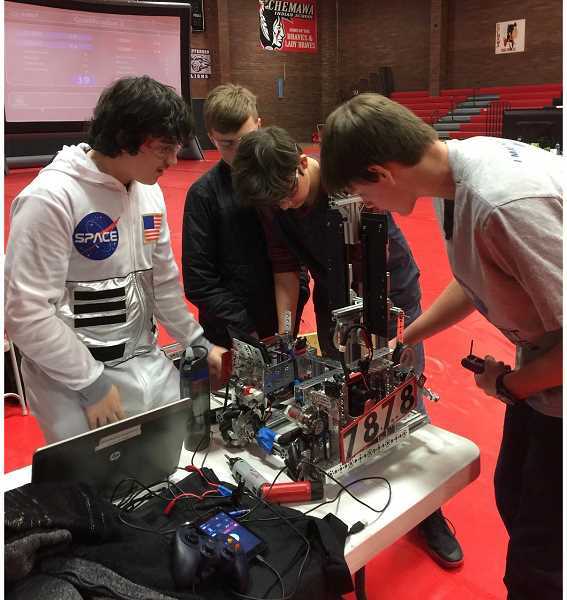 Teams will also undergo judging on their robot's design, their engineering notebook, provide evidence of their teamwork and team spirit, as well as community outreach activities. Matches begin at 11 a.m. on Saturday, Feb. 9, at Evergreen Middle School in Hillsboro and admission is free. The coaches of the team are parents, Angie and Chris Nissly, and the engineering mentor is Randy Prakken. The team's administrative support is provided by Jennifer Gingerich and the finance manager is Melissa Bussey. Team sponsors are: Cascade Engineering, BBC Steel, Direct Link, Canby Disposal, and Screaming Circuits, a division of Milwaukee Electronics. It takes about $6,000 a year to support the teams. And, in addition to the financial contribution, many of the sponsor's employees volunteer as referees, scorekeepers, inspectors and judges at league meets and tournaments.